The first reservoir constructed in Haslingden Grane was Holden Wood, opened in 1842 at the lower end of the valley. Soon after its completion the water company started to plan the Calf Hey reservoir closer to the village. The company began to buy up property not just at the location of the planned reservoir but in large parts of the valley. It was easier to purchase whole farms than smaller sections of them, and in any case the construction of the reservoir would have made several farms no longer viable. Calf Hey reservoir opened in 1860. The water authorities wanted to build a third reservoir between the Holden Wood and Calf Hey reservoirs, but this development was delayed until early in the twentieth century. In the meantime, however, concern was being expressed about the possibility of pollution from the upland areas that drained into the valley. It had been established that diseases such as typhoid and cholera were transmitted by infected water supplies, and there was a fear that water polluted by livestock and human inhabitants might enter reservoirs and cause disease. In 1898 a report on the Grane valley mentioned slop water being thrown on the ground and allowed to soak away downhill, privy contents as well as cowshed manure being spread on meadows sloping down towards the reservoir, and a sheep meadow recently top-dressed with human excrement. The water board responded by making further purchases and closing down farms throughout the valley. As we have seen, the last farming at Hartley House and Lower Ormerods occurred in 1899. In some places forests were planted in order to reduce the rate of run-off and improve the quality of the water. The development of a third reservoir, the Ogden reservoir, led to the closure of the Calf Hey cotton mill in 1906, the mill being one of the few buildings that were actually submerged under water. 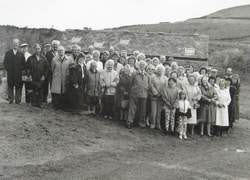 Haslingden Grane is a good example of a community whose former residents kept a close attachment to their place of origin after having to move away. Moreover, elements of that attachment have stayed with the following two or three generations so that among some local people there is still a sense of a distinct identity and a pride in regarding themselves as Graners. By the mid 1920s very few people were still living in Haslingden Grane village or the surrounding area. Many of them moved into Haslingden itself, especially on the western side of the town where they lived within a mile or two of their old homes. Some of them would return to the village to attend services at the Methodist chapel or St Stephen's church. A tradition of annual tea parties in the village was maintained. On Good Friday 1933, for example, 430 people attended a tea party at which there were five sittings in the chapel itself and five more sittings in the old school building. Visitors walked over the moor from Accrington, while Henry Kenyon, aged 80, came from Darwen. He claimed to have missed just one tea party in the previous 77 years. Henry Kenyon's great grandson James was christened at the Grane chapel in 1942, one of the last services to take place there before the chapel was demolished. The outcome for St Stephen's church was different. In 1926 the church was transferred from its place in Haslingden Grane village to the junction between the Grane road and the road to Helmshore, close to the boundary between Haslingden and Haslingden Grane. When the foundation stone was laid at the new site it was estimated that between eight and ten thousand people attended the ceremony. The tradition of annual tea parties was revived in 1991 by Jackie Ramsbottom, at that time an information officer at the Clough Head visitor centre. The tea party provided an opportunity for people with a personal connection with Haslingden Grane to get together and exchange stories and memories. Additional entertainment has been provided at subsequent reunions, with a brass band and a string quartet making contributions. I will end this section with a little travel advice. If you intend to visit Haslingden Grane by car bear in mind that the main road from Haslingden into the Grane valley has two numbers. It is both the A6177 and the B6232. The Duke of Wellington pub, one of the few buildings still standing in Haslingden Grane, offers an excellent carvery lunch.